Part Two of the "Get Your Blog Ready for Next Year" series. A blog that's easy to navigate is a blog that's easy to love. If your readers can find their way around smoothly, they're more likely to stick around longer and come back more often. 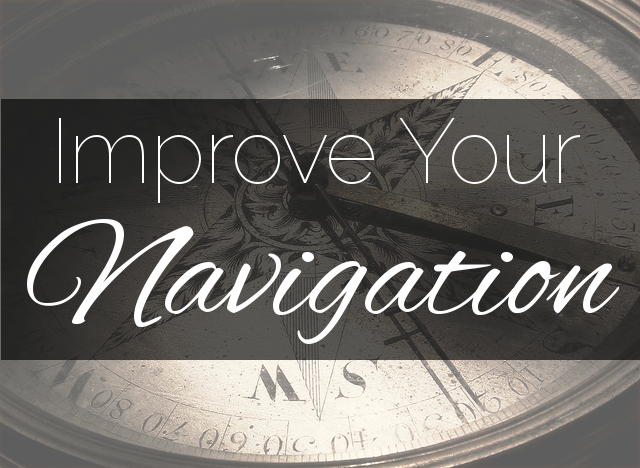 So, as you get ready to sail into the new year, take a little time to review and refresh your blog's navigation! When I say "navigation", I don't just mean your blog's main or top navigation. That's important, of course. But, there are so many other ways that your readers can find their way through your blog that are just as useful as your top navigation. Your readers are used to searching online — it may be how they found you in the first place! So, it's natural for them to search inside your blog, too. An easy-to-find search box is the best gift you can give your readers who want to find their own way around your blog. Every blogging platform has a built-in search option, so if you haven't enabled it yet, do it now! There's a common misconception that post tags are incredibly important for SEO. They're not. Search engines don't use them for ranking anymore — their attention is focused on the content of your posts. The primary function of a post tag is to help your readers find more posts on the same topic within your blog. With that in mind, take a look through your post's tags, and see if some of them can be trimmed away. Do you have redundant tags? Combine them! For example, the tags "pie" & "pies" could probably be combined into one tag. How about tags that only apply to one post? Are you planning to expand on that topic later, or is that just a bit of tag fluff? While you're reconsidering your tags, you may realize that you forgot a tag on some posts. Add relevant tags to those posts and you'll help your visitors find more posts on the same topic. Yay, better navigation! When I first started this blog, I hesitated to put up an archive, since I thought the "newness" of the blog might turn off readers. It wasn't until a reader gave me a friendly nudge via Twitter that I reconsidered and added an archive, which later evolved into the "Tutorials by Topic" page. When I checked my Google Analytics stats at the end of that month, I saw that readers were leafing through my archive every single day. And, during that same time, my readers' time-on-site also increased. I realized it was a terrible idea to hide my archive from readers who wanted to see more! If you've been shying away from giving your readers this navigation option, give it some thought again before you go into the new year. It doesn't have to be a whole page like mine — a footer's a great place for an archive too! Or, if you've got an impressive back catalog, you may decide it deserves its own place in your main navigation. Some blogging platforms give you an option to showcase your most popular content automatically through a gadget/widget. You can also manually create a selection of your best or most popular content to help your readers zero in on what makes your blog great. These links can go in a sidebar, your footer, or on a page linked in your top navigation. Giving this great content a place of prominence helps your readers get to know you better (and usually increases your pageviews, too). What can be done for the lost wanderers who come in through dead or misspelled links? You want them to stick around and find out how awesome you are, right? The best thing you can give a lost visitor is a useful "page not found" page (aka 404 page). It doesn't have to be fancy or complex — a friendly suggestion to use the search box, or a list of links to your most popular pages may be all they need to get back on track. If you're on Blogger, you can use the "Custom Page Not Found" option to create a useful 404 page. For self-hosted Wordpress, you can manually edit your 404.php file to customize your "not found" page, or you can use a plugin to customize it. Other blogging platforms aren't quite as flexible with 404 pages. If you're not able to customize your 404 page, I recommend that you make your archive and search box easy to find. So now that we've covered self-directed ways your readers can navigate through your blog, let's take a fresh look at your main navigation! Your main navigation is often the first thing your readers see on your blog. Search engines give it a lot of attention, too. But, it's also a major hotpoint for clutter. Too much navigation is worse than too little navigation — it can confuse and overwhelm your visitors. There are no firm rules about what exactly you need to have in your blog's main navigation. But consider stripping it down to just the bare essentials. What do you want your readers to know right away when they land on your blog? What can't they find easily with the other navigation options you've made available to them? Put that in your main navigation. Using myself as an example: I chose to put my tutorial archive, resources, and contact page in my top navigation so new readers can quickly see that they can get help and information from this blog. I also make heavy use of secondary navigation options: the search box and links to the most popular posts are featured in the sidebar on computer screens, and at the bottom of the post on mobile screens. This all works together to make my blog browse-friendly without overcrowding the top navigation. When you're reconsidering your main navigation, take into account the changes and updates you've made to the other navigation avenues in your blog. If you've expanded or improved the other navigation options on your blog, your readers who want more will have an easy time finding their way. You can safely unclutter your main navigation. Move on to part three, Keep Your Archive Fresh. Compass photo CC-BY Walt Stoneburner.